Editor’s note: El Mahdi Wahib submitted his following personal story to Global Young Voices. You too can submit yours to us here. I want you to imagine yourself living in the mountains, in a remote area, and suddenly, one cold rainy night, your little brother gets very sick; but there is no doctor around to help him. Imagine that your mother needs to deliver a baby tomorrow, but the nearest hospital is 15 km away, and with the harsh roads there is just no way a car can get to your place fast enough. Imagine that you have to go into the city to buy antidiabetic drugs for your grandfather, but the snow is blocking all the roads. Did you know that 32 percent of Moroccans don’t have to imagine this? In fact, they live in rural places and have to face those kinds of situations all the time. I'm a medical student and an engaged citizen of the world. I always dream big, I'm competitive and always aspire for the best, in myself and in others. I believe everyone was born for a reason: to bring out something special and unique out into the world. 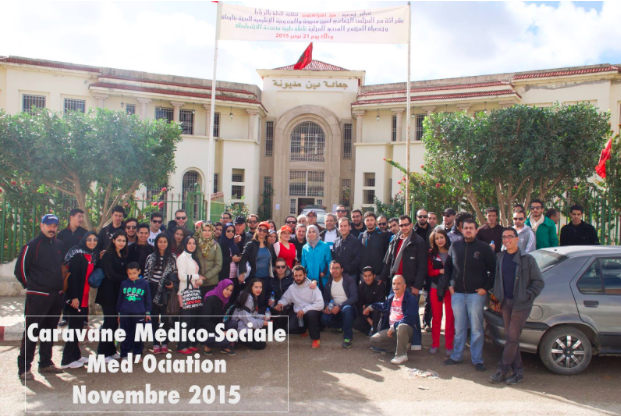 This is exactly why we, as Moroccan medical students, decided to take action. Last year, we travelled through different villages on 7 caravans, offering free check-ups and giving out free medications to the villagers. We even did cataract removal surgeries and over 100 circumcisions. We also educated the villagers about preventive measures, healthy living conditions and hygiene. In the end, we took patients in most urgent need to the city, so that they could be taken care of and fully treated. Over the course of two years, we have been able to help over 8000 people. Now, the next step is to look for a long-term solution. After having collected all the necessary data to have a clear picture of the major needs of the area, we would then cooperate with our professors and doctors in the city to start local trainings for teachers to follow kids’ health and growth, for traditional birth attendants, for women to ensure reproductive health and also for the population on preventive methods. The following next step would be to buy materials and install a local health center where we could coordinate with doctors in the city to offer telemedicine check-ups, and also train technicians to monitor the devices in the rural area. That same technology could also be used for another very important purpose: education. Many children in remote areas have to travel more than 10 km a day on foot to go to school, with only one teacher handling three or four classes. Technology would allow them stay in the village and remotely get them in contact with the teacher in the city. After implementing the project locally, our vision is to collaborate with associations across Africa to foster it in different African countries that are also facing the lack of healthcare access in remote areas. In Morocco, more than half of the citizens don't have access to proper medical care, especially in rural zones where they have no health centers. Also, there is a huge lack of health access for people with disabilities. Health professionals here are not aware, not even educated, on how to deal with them, and our facilities don't offer them proper access to the healthcare system. This is why we decided to organize conferences and activities that aim at raising awareness about disabilities, to help people with disabilities live a better life. It’s our duty, as young people, to be a light in the darkness for these people, to help get them out of their isolation, and give them a new life.